The fourth CA Open Studios took place over the weekend of the 2nd & 3rd September - and was better than ever. We're in the process of setting up a gallery of pictures taken during the weekend, so if you have any you'd like to share, please email them to Gaye Jee. Sue Petszaft, who co-ordinated the event, writes: "Open Studios 2017 was a great success – with many new faces this year and also many new artist participants. Our publicity seems to be paying off and people are coming from further afield and putting the event on their calendar. We even seem to have started a ball rolling locally as I believe other areas are thinking of holding their own local Open Studios rather than taking part in the larger South East Open Studios event which has taken place for many years. These local events mean that many more artists can take part, and they become community events rather than just for the ‘art geeks’. At Studio 1 we had more than 100 visitors each day, with lots of wonderful comments and sales too. I’ve always been amazed that this first weekend in September seems to have wonderful weather, and the same held out for this year, until later on Sunday when the drizzle and chill set in. Nevertheless the visitors kept on coming and their kind comments warmed our hearts!! This is my last year of co-ordinating and I am very happy to hand over the baton to our excellent team. Both they and our artist participants have lots of good ideas for next year – it has really been a co-operative endeavour as all the artists have played their part in creating their art, preparing their Studios and also doing a great deal of publicity locally and to their friends. Without all hands on deck it would have been a huge task to have such a comprehensive publicity presence. 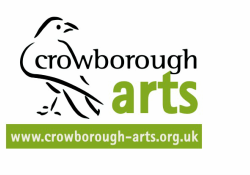 Crowborough Arts Open Studios is sponsored by Crowborough Town Council and Wood and Pilcher Estate Agents.